On July 16, leaders of the industrialised world at the g8 summit adopted a plan of action on global energy security ignoring worldwide protests against nuclear power. At St Petersburg, the host city of the G8 summit, Russian riot police arrested 37 activists who were staging a blockade at the entrance of a hotel for participants. Russian authorities had pre-emptively arrested at least 200 activists before the g8 summit and forbade protesters from leaving an alternative conference in St Petersburg held on the previous day. 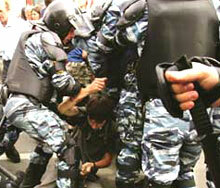 The police even attacked and arrested journalists who were covering the protests, said media reports. Earlier international demonstrations occurred on July 14 and 15 in the us, the uk, Venezuela, New Zealand, the Netherlands and Germany. Activists warn that nuclear energy cannot be considered a positive way to reduce carbon emissions and combat global climate energy. But the g8 countries believe that nuclear power will contribute to global energy security, while simultaneously reducing air pollution and addressing climate change challenges. Germany is an exception: it is the only g8 country not considering the use of nuclear energy and actually planning to close its existing nuclear power plants by the early 2020s.